Steele Saddle will be your best choice. I have had 4 Rockies, and these fit them all. – Lee Ann P.
My wife and I both have Steele Saddles!! I used to own nothing but old school Billy cook style saddles for years until they started making my walker sore! I tried Steele and can’t believe how my horse didn’t get sore. And I ride a lot!! And I ride a lot of different horses from thinner type walkers to blocky style quarter horses and the saddle always fits!! I never thought I would like this style saddle, but I actually love it!! And dealing with Eric Hawkins Steele Saddle company is a pleasure great people – Kenny F.
I have a Steele Trail Boss Saddle, and I love it. It is comfortable, beautifully made, and the craftsmanship is plain to see. When I saddle my horse I can’t help feeling proud of it. I have had many questions about it. THANK YOU. – Deborah M.
I waited until I could try it out, and I have to say I LOVE IT! It’s probably the most comfortable saddle I’ve ever ridden! Thank you for answering all of my many questions too! I do have one more though. Is there a way to use it on a bigger horse like a TWH? I’m unfortunately having to sell my Paso. Thank you again! – Arlene K.
Picture of Nico with my Steele Saddle & Bridle. He and I both love it! Thanks so much! – Sharon G.
I absolutely “love” my saddle. I bought it used, and it was amazing at how I seemed to notice his gait improve. I believe it freed him up on the front end and allowed him a lot better movement, giving him a lot better gait. We have been all over and I truly can say this saddle has made my riding more enjoyable. I have literally rode all day in it and no pain whatsoever. Thank you Steele Saddles, keep up the good work. 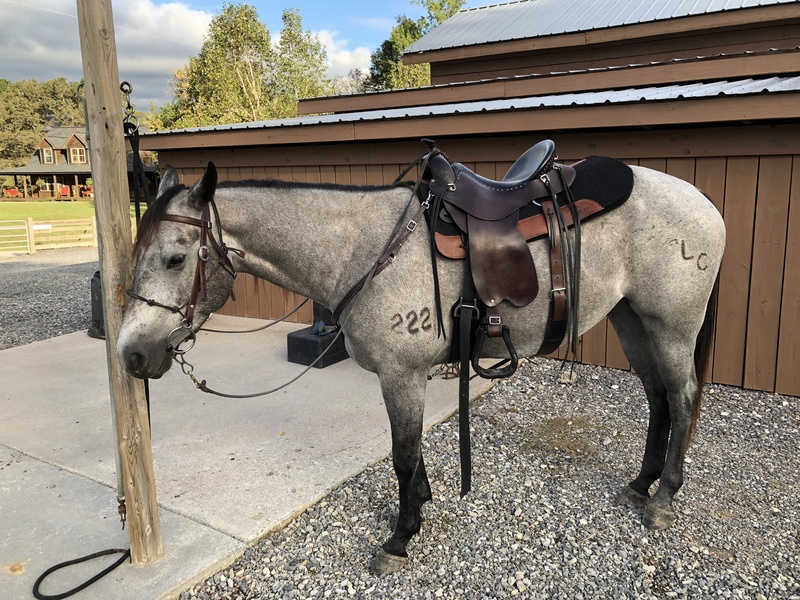 – Rebecca M.
My Steele Trail Boss saddle is beautiful!! Ya’ll did a great job!! – Gabby D.
I writing to let you know that so far you’ve done such an awesome job at making a big decision like purchasing a saddle so easy for me. Steele has made it so simple by answering all my questions and concerns, and I want to thank you for that. First of all my Arabian isn’t an easy fit, so having the opportunity to try the demo really made this purchase rock solid. This is the most comfortable I’ve ever felt! My horse can move freely and she is happy too. It’s light weight and crafted well, and definitely impressive. From the moment I unboxed the demo to actually trying it out on my horse, along with your expert tips, gas made this a positive experience. You’ve made it virtually impossible for me not to love it. The demo program is key to this perfect fit.. and it’s so worth it. I’m so looking forward to my finished saddle!